Award winning hotels in Betws-y-Coed join with gr8trails to offer quality, guided, outdoor adventure weekends in the Snowdonia National Park. For our short breaks and outdoor activities in North Wales and Snowdonia, gr8trails can now recommend our guests stay at the AA3star former coaching Inn, the Royal Oak Hotel, and the local Waterloo Hotel and Lodge, set in the Welsh village of Betws-y-Coed. Surrounded by the magical Gwydyr Forest at the foot of the Snowdon mountain range, this is a great base for a weekend mountain biking, hill walking, shopping and other activities. The 2008 Routiers award winning Royal Oak Hotel has 27 well equipped, en-suite, contemporary rooms set in a traditional period design, maintaining the character of the hotels Victorian heritage. After a long day on the hill or for that special occasion you could stay in one of their deluxe 4 poster feature bedrooms or request a Jacuzzi whirlpool bath! Once you have freshened up from your day out, you can join us in one of the three hotel restaurants. 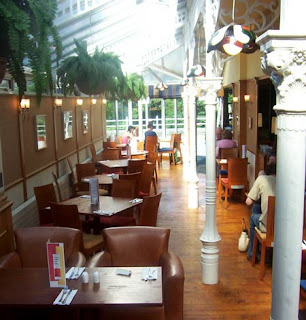 The acclaimed Llugwy River Restaurant, uses the finest Welsh ingredients in it’s extensive a la carte menu. Alternatively, locally sourced food is also available in the Grill Room and Stables Bistro. 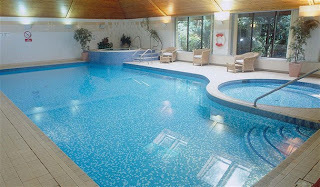 For a more contemporary atmosphere the AA3star Waterloo Hotel and Station Leisure Spa offers good quality rooms including all modern conveniences with the added bonus of full membership to the on site Leisure facilities and Spa – great to relax in after a long day out. Once you are sufficiently relaxed and rested we can join you for evening dinner in Bar 1815, an ideal place to eat, drink and relax. Whichever style of accommodation suits your pocket, we can guarantee that the owners of both our preferred accommodation partners in Betws will make you feel very welcome to this stunning area and will ensure that you enjoy every minute of your stay with them. Post dinner, at either location, kick back and relax with your friends, family or group, as the sunsets in the beautiful valley around you and enjoy sharing your experiences of the day, whether that be guided mountain biking, walking or various other activities gr8trails can provide. Both hotels are located within walking distance of the local train station (3-4 hours travel from either Manchester or London mainline stations). Alternatively, Betws is 5 hours drive from London & under 2 hours from Manchester. On behalf of gr8trails, Royal Oak Hotel and Waterloo Hotel, we all look forward to welcoming you to the beautiful mountains of Snowdonia. What to pack this Spring for your outdoor adventure? With the vagaries of the British weather, the only thing you can guarantee is that the weather during a weekend in the great Outdoors could very well vary from wind and rain to glorious sunshine. So, for a walk in the countryside this Spring don’t forget to pack a few of those essentials. A waterproof coat and trousers are invaluable. A good set of waterproofs will not only keep you dry but also act as a brilliant windproof, keeping you nice and warm inside. Plenty of layers underneath will keep you warm but also allows you to remove a layer or two if you get too hot or the weather turns out for the better whilst you are out and about. Layers also trap warm air between them, acting as additional insulation. Layers made from high wicking fabrics and fibres (wool & synthetics) are recommended, since these do not hold moisture as you perspire during activity. We wouldn’t recommend cotton tshirts or jeans, these get heavier when wet, do not dry quickly and denim also chaffs, ruining your day out. If you’ve seen the forecast and it looks to be staying fine, new fabrics jackets made from softshell are far more breathable than your waterproof and yet insulating at the same time. They would weather well in rain showers too, but perhaps not so well in persistent rain! Even at this time of year, the weather can be cold, especially with the effect of the wind, so don’t forget to pack your gloves and a warm hat in your pack. Most forget that you can loose up to 30% of your body heat through your head, so you can very easily control your body temperature through the use of a good warm hat. A good pair of walking boots would be recommended. If you have ‘worn these in’, perhaps around the home before your weekend, this will ensure that you don’t develop any sore spots or blisters once out and about. A good pair of socks, or a double pair, will ensure you have a comfortable and enjoyable day out. The weather can be exceptionally warm here in the UK, especially in the Spring months, when the sunlight is more direct. Make sure you have extra water, sunglasses and sunscreen when the weather is forecast to be good. gr8trails have shortlisted a range of kit on their website, which you can also conveniently download and use as a checklist. gr8trails offers, all inclusive guided mountain biking and walking short breaks and weekends away, throughout the UK. Bringing ‘adventure to everyone’, no matter what your age, experience or ability. Our short break and weekend destinations include the stunning Lake District with dramatic mountains, endless lakes and golden wooded meadows. Alternatively, history-rich North Wales and Snowdonia or hiking amongst the wide green views and rugged edges found in the Derbyshire Peak District or Yorkshire Dales. For those willing to venture a little further and wish for greater challenges we offer week long breaks to our Scottish destinations. Gregory do it again!, from off the shelf, the Z35 sets out to impress. Just like the Gregory Miwok18 action pack, loading the Z35 with gear from my old hillwalking pack, it still had more than enough room to spare. Like most good sized daywalking/guiding packs the Z35 follows the typical design, of main compartment with drawstring top access and flip over top hood. The additional feature is the front zip access to the main compartment, allowing you to retrieve/stow gear without having to release the hood buckles and drawstring. A great idea when you need something in a hurry eg waterproof top and trousers! The main compartment is expansive, fitting at least the quoted 35litres of gear inside. The hood follows the same voluminous theme, with 1 internal and 1 externally accessed zipped pocket. We like, the under hood pocket zip, opening in such a way that all the contents don’t fall out when opened!, like in some other packs available in the market – something to look out for. Nice addition of a key loop in the top pocket too! The main compartment also has a top tensioning webbing strap and quick release buckle, allowing quick stowage of a loose fleece or to keep the contents of a half filled pack closer to your pack and maintaining your centre of gravity. Hydration bladder can be stowed within the main compartment in its own pocket, with a fabric port for your drinking tube on both sides of the pack, allowing you to route down either shoulder strap. There’s also all the normal things you’d expect to see on a pack of this quality; haul loop, high vis hits back and front, adjustable chest strap, high wicking mesh on all contact areas, mesh side bottle pockets, walking pole loop, hard wearing diamond ripstop fabrics etc, etc. Whilst out walking, the shoulder/waist straps & unique Jetstream Dynamic Transfer System keep the pack close enough to your back, whilst not impeding movement or knocking you off balance. The Jetstream system keeps the pack off your back to allow airflow, but not too far off to unbalance you when walking. Forward pull/quick release waist straps/buckles are intuitive to use and ensure a snug comfortable fit round your waist. The integral zipped waist compartments on both! waist fins, allow easy access to snacks on the move too. This pack also features an expandable, easy access front pocket for stowage of a map or waterproofs whilst on the move, ensuring there is no need to stop whilst out on the hill. There is also a zipped pocket for stowage of the inclusive waterproof pack cover. Overall, again very impressed with this Gregory pack. It looks sharp, is understated in its capacity, is lightweight and offers abundant versatility. Enjoy your walk! Don’t forget the rest of your essentials on our recommended kit list. A broader range of Gregory packs & Source hydration bladders are available from our retail partner Ellis Brigham, Mountain Sports. Click here to find out more about the broader Gregory pack range our recommended pack brand partner and hydration partner, Source.